Thanks to my dear friend Rachele who sent this adorable Valentine to the minnies. 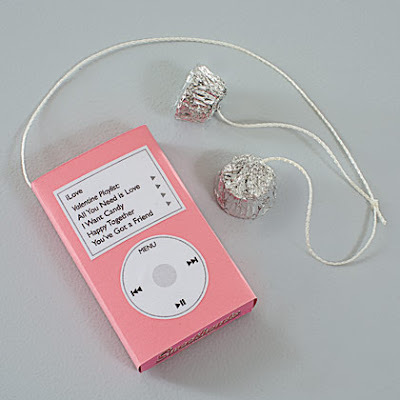 Rachele is such a creative crafter and made these ipod-like Valentines, called the ilove, for her son's classmates. It's amazing how a simple box of conversation hearts and peanut butter cups can make two little girls' day! You can make these for your own Valentines with these simple instructions from Family Fun. Wishing everyone the best Valentine's Day! That is a great idea. Happy Valentine's Day! Oh, I have to make these next year!